We begin with the buildings--some 40, some 70, some 100 years old. Most are neither fancy nor ambitious works of architecture, but as evidence of communal energy and purpose they are important. As products of art and industry they bear the marks of the style of their time. And, style, like tea leaves, can be read for clues to the past and omens for the future. Our small-town synagogues can be easily sorted into two stylistic groups, one built before and one after WWII. Most anyone without special training would label the prewar buildings "old-fashioned" and the postwar buildings "modern". Modern architecture did not, of course, appear fully formed after WWII, but it did become widely acceptable. The experience of the war changed public consciousness in a way that made modern architecture palatable, and at the same time it made Jewish life in small towns untenable. The prewar synagogue was the religious equivalent of the one-room schoolhouse. Imagine Rosh HaShanah in early September anywhere in Texas before air conditioning. The steps are filled with schmoozing teens, the foyer with middle-aged "ushers" and inside, the big windows, each dedicated to someone or their simcha, are open for daydreaming and the occasional zephyr. It made a nice package whose construction economy and natural design imperatives mandated an architectural program hard to mess up. The nature of Jewish observance did not seriously influence small-town synagogue design. Although many of the earliest synagogues in Texas were founded by German Reform Jews, most communities were a mixed bunch: more Orthodox in the early years but tending toward minimal observance if not nominally Reform later on. 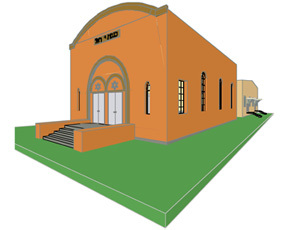 Only Brenham remains resolutely Orthodox to this day with a bimah in the center and separate seating for men and women. More important were the theatrical considerations common to any meeting hall--sight lines and acoustics. Some of the smallest temples had raked (sloped) floors and theater seats. If architectural pretension could be measured on a scale from "mud hen" to "peacock", the more liberal, affluent, and western-influenced groups tended toward showier plumage. In the fashion of historic revival certain Reform congregations infused their building designs with romantic sentiment for faraway times and places. The "modern" in architecture is a matter of substance and attitude. In the late 19th early 20th centuries newly developed structural (steel/reinforced concrete) and mechanical systems (electric light and later air conditioning) altered construction and therefore design. The heavy masonry bearing wall whose thickness had provided such a rich medium for decorative detail was replaced by a structural frame covered by a thin skin on which decoration looked stuck-on and out of place. Windows were demoted from architectural events to incidents, superceded in function by artificial light and air, which also made deep interior space habitable and freed the building envelope to assume any shape. Eventually the natural limits of climate, terrain, and region (before design imperatives, later sentimental attachments) fell away as well. As the pace of life quickened from pedestrian to vehicular speed, the perception of buildings changed from the set-piece to the moving target. What had been heavy, its parts concealed in a compact, decorated mass, rooted, and stationary was now broken into its constituent parts, austere, almost bouyant, nearly mobile. "Modern" is synonymous with "progressive", the essential attribute of our time. What doesn't move ahead attracts flies, begins to decay and dies. WWII was a war of movement--of blitzkrieg and mechanized units. Stationary positions like the Maginot Line became symbols of defeat, wrong-headedness. "Action" had potent meaning in several languages. Giant factories and the Pentagon, the largest building in the world, were built in months. Liberty Ships slid down the ways, planes, tanks, and trucks rolled off the assembly line in record numbers. After victory it was hard to slow down. And as Ronald Reagan announced every week on TV in the name of GE: "Progress is our most important product." The postwar synagogue, now air conditioned, was all inside and up-to-date. From its origins as a mere building it had grown to institutional complexity. Its many parts (sanctuary-social hall combo, classroom wing, administrative suite, library, cloak room, bride's room, board room, giftshop, etc., etc.) were sized for the future and arrayed for efficiency. It made a lumpy package but form, after all, now followed function. The congregations, no longer mostly greeners, had more to say to the community at large and used their new synagogues as silent mouthpieces. The postwar synagogue made it clear that its congregation was modern, progressive, and fit to belong, especially to the still-restricted country club. The social barriers dissolved just as they became irrelevent, because it was clear the postwar generation would not stick around to enjoy drinks around the country club pool. They went off to college and never came back. The Life or death of a community has more to do with ecomomic and cultural opportunity than building style. The scrap yards, grocery, furniture, and clothing stores, vehicles that carried Ma, Pa, and the kids through the depression and the War, could not be squeezed to provide a living for each grandchild, even if they hadn't already become professionals. When the boys came back in 1945 little was like it was. New products, new ways of doing business, new attitudes and awareness eroded the just-two-generations'-old bonds holding Jews to their towns. The action was elsewhere, in the big cities and on the coasts, and Jews wanted to be in the middle of it. The small-town synagogue is an intermediate marker, a souvenir of our passing through town on our way to another place.